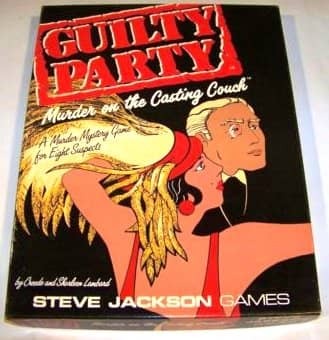 First in Steve Jackson (I)series of adult murder/mystery party games. Not sure if any others followed. Standard issue, very much like How to Host a Murder or Murder Mystery Party line, only no audio tape. However, each invitation includes a mini-newspaper with background information about the murder. Who Killed the Studio Chief? The date is 1927. The place is Hollywood. The crime is murder. Arthur McCutcheon made a lot of movies. He made a lot of enemies, too. When he was found dead in his luxurious office, it was easy to find suspects. Too many suspects! Matt Montgomery, dashing star of the silent screen? Kathleen O'Shea, Superior Studios' leading lady? Olaf Hedrikssen, the brilliant Danish director? Betty Sue Wilson, Iowa farm girl turned starlet? Wilbur Andrews, the famous inventor? Irma Meyers, hair stylist and girl Friday? Alice Chatterly, the gossip columnist? Clyde Willoughby, insurance adjuster and movie buff?